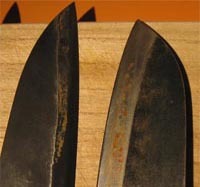 Did you know for example, why blacken fruit knives?! If you add some fruit juice to solution of iron salts (iron salts solution can be got easily at home, if to put, for example, a nail to copper sulphate, for half an hour or a few buttons, paper clips), the liquid will darken. We will get the weak solution of the ink. Fruits contain tannic acid and form ink with the salt of iron. In order to get a solution of iron salts at home, dip the nail into a solution of copper sulphate, and wait ten minutes. Then drain the greenish solution. The resulting solution of ferric sulfate (FeSO4) can be used in reactions. Tea also contains tannic acid. A solution of iron salts, added to a weak solution of tea, change its color to black. It is not recommended to brew the tea in a metal kettle! Sometimes iodides of sodium or potassium add to food salt. It because iodine is included in various enzymes of the our body, and its deficiency impairs functioning of thyroid gland. The dishes in which you did the experience, easily clear with a solution of citric or oxalic acid. These substances restore the manganese to oxidation state +2 and transfer it to water-soluble complex substances. Solutions of potassium permanganate can persist for years in dark flasks. Many believe that potassium permanganate is highly soluble in water. In fact, the solubility of this salt at room temperature (20 °C) is only 6.4 g per 100 g of water. However the solution is so vivid coloring that seems to be concentrated. So it often get in the laboratory. Therefore, for our purposes it is better to use a diluted (about 5%) sulfuric acid. You can replace it with dilute acetic acid — vinegar. Take about 50 ml (? cup) of the acid solution, add 1-2 g of potassium permanganate (on the tip of a knife) and mix thoroughly with a wooden stick. Then wash it with water and tie it to the end of a piece of foam sponge. This "brush" quickly, but gently squash the oxidation mixture on the contaminated polluted place. Soon the fluid changes color to dark red and then - brown. The oxidation reaction began. Here it is necessary to make a few comments. It is necessary to work very carefully so the mixture does not get on hands or clothing; it would be good to put oilcloth apron. And you should not hesitate because the oxidation mixture is very caustic and "eats" even the foam. After using the foam brush can be put in a jar of water, rinse and throw away. During then cleaning can cause unpleasant smell produced by the products of incomplete oxidation of organic pollutants on the porcelain and the acetic acid, so the room should be aired. After 15-20 minutes we'll take the browned mixture with water. On the place appear brown spots, don't worry: the product recovery of the permanganate — manganese dioxide MnO2 is easy to remove, restoring insoluble manganese (IV) to water-soluble salts of manganese. 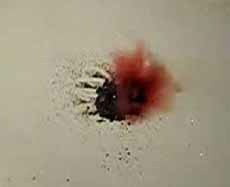 But when the potassium permanganate interacts with concentrated sulfuric acid, it forms the oxide of manganese (VII) Mn2O7 is an oily dark-green liquid. This is the only liquid under normal conditions the oxide of the metal (T melt=5,9°C). It is very volatile and easily explodes with a slight heating (t=55°C) or concussion. Mn2O7 is stronger oxidizing agent than KMPO4. When contacted, it ignite many organic substances such as ethyl alcohol. It is one of the ways to light a spirit-lamp, with no matches! It only remains to wash out soluble salt of manganese with water. The same way you can use to clean soiled aluminum pan: in the presence of strong oxidizers on the surface of the metal forms a durable protective film of oxide, then protects it from dissolution in acid. But cleaned with this method of enamel products (pots, tubs) not recommend: acidic environment slowly destroys the enamel. For removing plaque MnO2 can also used aqueous solutions of organic acids: oxalic, citric, tartaric. Acid create in an aqueous solution sufficiently acidic environment. Of course, gold is not present, but the experience is beautiful! For chemical reactions we need a soluble salt of lead (lead acetate (CH3COO)2Pb - salt formed with dissolving lead in acetic acid) and salt of iodine (e.g. potassium iodide KI). Lead acetate can be got at home, dropping a piece of lead in acetic acid. Potassium iodide is sometimes used for etching electronic boards. Potassium iodide and lead acetate are two liquids, the appearance is no different from water. Stationery glue is liquid glass or its chemical name "sodium silicate" Na2SiO3 We can say also it is a sodium salt of silicic acid. If add glue the silicate solution of acetic acid, the precipitate will fall out as insoluble silicic acid, hydrated silicon oxide. Another beautiful entertaining experience with liquid glass. We will need copper sulphate CuSO4, sulphate of Nickel NiS04, ferric chloride, FeCl3. Do chemical aquarium. 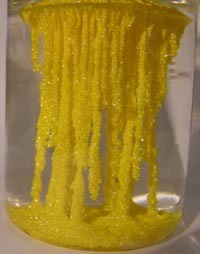 In a tall glass jar with silicate glue, diluted with water, simultaneously pour out from two glasses the aqueous solutions of Nickel sulfate and ferric chloride. In the jar gradually grow silicate "algae" yellow-green colours that intertwine, fall from the top to down. 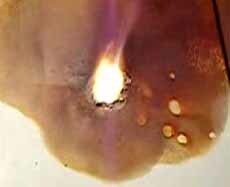 Now add in a jar drop by drop a solution of copper sulfate, populate aquarium "sea stars". Algae growth is a result of crystallization of hydroxides and silicates of iron, copper and nickel, these are formed as a result of exchange reactions. Add the iodine to a few drops of hydrogen peroxide, H2O2 and mix up. After some time we will have a highlighted black precipitate. This is crystalline iodine is poorly water soluble substance. 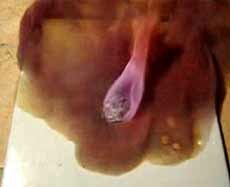 Iodine drop out faster if the solution is slightly warm with hot water. The peroxide is needed to oxidize potassium iodide KI (it is added, to increase the solubility of iodine). With the poor solubility of iodine in water is another its ability - to be extracted from water by liquid composed of nonpolar molecules (oil, gasoline, etc.). In a teaspoon of water add a few drops of sunflower oil. Mix up and see that the oil is not miscible with water. Now if there is to drip two or three drops of tincture of iodine and shake, the layer of oil will turn dark brown color, and the water layer is pale yellow, i.e. most of the iodine will pass into the oil. Iodine is very corrosive. To verify this, a few drops of iodine put on a metal surface. After some time the liquid becomes discolored, and the metal surface will have a stain. The metal is reacted with iodine with formation of iodide salt. On this property of iodine based one way of drawing on metal. Substance "ammonia" we mean an aqueous solution of ammonia. In fact, ammonia is a gas that when dissolved in water and forms a new class of chemical compounds - "base". With the base and we'll have experiment. Entertaining experience can be done with a solution of ammonia (liquid ammonia). 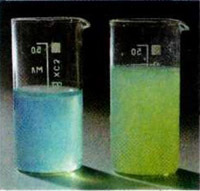 Ammonia reacts with copper ions and form color substance. Take a bronze or copper coin with a dark patina and fill it with ammonia. Immediately or after a few minutes the solution will turn blue. It is with the action of the oxygen in the air the copper formed a complex substance. Ca(OH)2 + CO2→ CaCO3 + H2O. This reaction is also high quality reaction for calcium ions Ca+ in solution. The resulting substance, calcium carbonate is well-known chalk (lime, crayons).